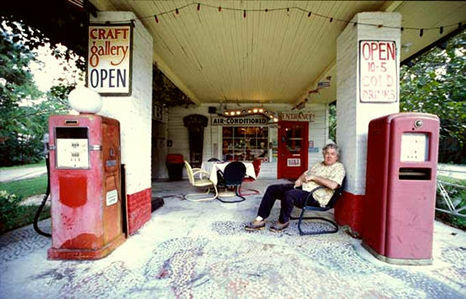 John Preble, artist/inventor and creator of the whimsical UCM Museum, in Abita Springs, Louisiana grew up in the New Orleans area. As a young man of ebullient enterprise he had so many career interests that his friends had an amusing business card printed for him. The card listed some two dozen of his then current pursuits – artist, potter, art instructor, antique shop owner, beekeeper, personality profiler, musician, carpenter, politician, real estate salesperson, computer consultant, graphic designer, publisher, filmmaker, festival promoter and entrepreneur. Now even the casual visitor to his offbeat environment can see that all the different paths Preble walked inevitably led him to this one fascinating place – his UCM Museum. In 1979 Preble married artist/jeweler Ann O'Brien (1951-2006) of Covington, Louisiana and they settled in Abita Springs where they began making a family a few year later. Both artists are well known for their work, Ann for her jewelry and John for his paintings of Creoles. The idea of building the UCM Museum came when the Preble family was vacationing in New Mexico. It was in the little town of Sandia Park where they found Ross and Carla Ward's Tinkertown museum and environment. Putting this museum together obviously required an incredible resolve to scavenge. 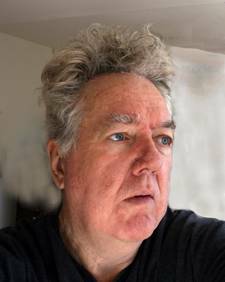 Preble admits that even before he knew he would be a "museum curator," he had explored every junk shop, garage sale, and dumpster in Southeast Louisiana – hunting and gathering all of those strange artifacts that now make up his unusual vision of the South. Preble throws nothing away. A pull tab from a can drink becomes a station wagon's tail light. A plastic fork becomes a radiator grill for an old farm tractor. Preble has often said that he asks himself daily is: "What would be fun?" And the museum answers this simple question a million times. In small towns throughout the South, life is not lived at top speed. With authentic grace, the UCM's affection for the Southern small town is reflected in Preble's animated dioramas. In the museum there is one diorama of a mobile home park -- a small sign in front of a trailer-home reads "Cute Bunnies, Live or Dressed." Perhaps the UCM's slogan should be, "The South, Live or Dressed." .